Preserving the planet is everyone’s responsibility. At home or at work, it’s important to look for ways to conserve resources and lessen our impact on the environment. These simple changes to your everyday behaviors can make a big difference for future generations. 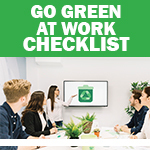 Show good stewardship of the environment by making choices that will keep your office organized while keeping the planet healthy. 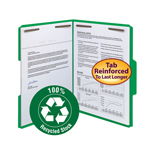 Smead recommends using 100% Recycled Hanging Folders and 100% Recycled Hanging Box Bottom Folders with Viewables Labels in file drawers. 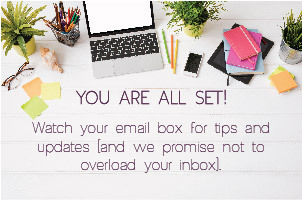 Use less paper, ink and toner by not printing e-mail messages or other electronic documents unless you need to refer to them when you’re not at your computer. 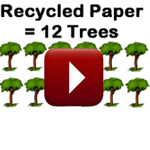 Use recycled paper in printers, copiers and fax machines. Print on both sides of the sheet. Turn off equipment and lights that are not being used. Set computers and monitors to go to sleep mode when idle for long periods of time. Don’t purchase more supplies than you need. 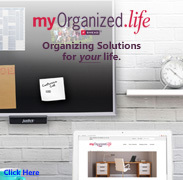 Large quantities require you to have more storage space, which consumes more energy. Use online methods for bill paying, reviewing account statements and other transactions or communications to cut down on paper use and mailing. Buy office supplies from companies like Smead who practice sustainable manufacturing processes. 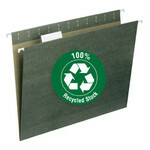 Use a 100% Recycled Hanging Folders to keep documents organized in your file drawers. 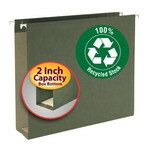 Use a 100% Recycled Hanging Box Bottom Folders for bulky materials such as magazines, catalogs or large reports. The reinforced flat bottom keeps the material neatly upright in the drawer. 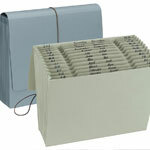 Label the folders or pockets with Viewables labels and tabs for clear identification. Align the tabs in the same position on each file to save time looking for files using the Straight-Line Filing method. RECYCLE, REUSE OR REPURPOSE SUPPLIES. Purge files frequently to eliminate unnecessary document storage. Shred and recycle the paper. Recycle toner cartridges from printers, copier and fax machines. 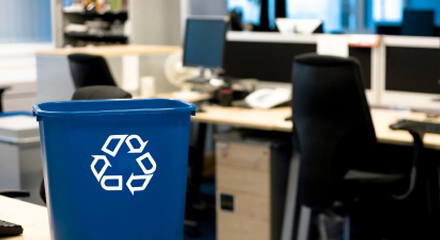 Implement a recycling program at your office for paper, glass, cans, etc. Give unneeded items away instead of throwing them out. Use online sharing lists and websites to find others who can use your discards.